Biologists have developed an efficient way to genetically modify human embryonic stem cells. Their approach, which uses bacterial artificial chromosomes to swap in defective copies of genes, will make possible the rapid development of stem cell lines that can both serve as models for human genetic diseases and as testbeds on which to screen potential treatments. “This will help to open up the whole human embryonic stem cell field. Otherwise, there’s really few efficient ways you can study genetics with them,” said Yang Xu, professor of biology at the University of California, San Diego who directed the research, which was funded by California Institute for Regenerative Medicine, the state’s stem cell research agency, established after the passage of Proposition 71. Xu and co-authors Hoseok Song and Sun-Ku Chung, both postdoctoral fellows in Xu’s research group, describe their technique in the January 8 issue of the journal Cell Stem Cell. Most attempts to alter the genetic makeup of the cells have proved too inefficient, Xu said. His group used bacterial artificial chromosomes, or BACs, to improve the yield. BACs are synthesized circles of human DNA, which bacteria will replicate just like their own native chromosomes. Commercially available BACs can be modified within bacterial cells to insert altered copies of specific genes. Once the modified BACs are introduced into human cells, they will sometimes pair up with a matching segment of a human chromosome and swap segments of DNA, a process called homologous recombination. The advantage of using BACS to alter the genetic code in human cells comes from the long flanking sequences on either side of the modified gene, which increases the chance that the BAC with line up with native DNA in position for a swap. Other genetic approaches have been limited by shorter segments of DNA. Using BACs, the team was able to substitute modified genes in 20 percent of treated cells. Standard methods of genetic modification typically achieve modification in fewer than one percent of cells, Xu said. His group successfully transferred a defective copy of the gene p53, which suppresses cancer, into a human embryonic stem cell line. By repeating the process in a second round, they developed a line of cells in which both copies of the genes were disrupted. They also report success with a different gene, ATM, which when mutated in humans causes Ataxia-telangiectasia, a disease characterized by a host of systemic defects including increased cancer risk, degeneration of specific types of brain cells and degraded telomeres, the protective caps at the end of each chromosome. Genetically engineered mice with two bad copies of the ATM gene share some of these traits with human patients, but not all. Neurons don’t degenerate in ATM mice, for example, and the telomeres are long. “If you want to study accelerated shortening of telomeres, you can’t do it in the mouse. You can only do it in human cells,” Xu said. Those differences propelled Xu’s group to develop human cell lines instead, with the hope that some of the processes that go wrong in human patients could be studied in the lab. Already, they have demonstrated that their ATM-deficient embryonic stem cell line has damaged telomeres. Other characteristics, such as the degeneration of specific types of neurons, will be the subject of future experiments, Xu said. The authors say their approach can easily be adapted to modify other human genes within other stem cells lines. 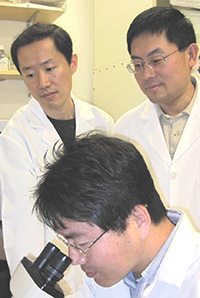 For their initial work, Xu’s group used a cell line that easily forms new colonies from single cells, but they also repeated the procedure in a cell line called H9, which has proved difficult to manipulate. Because H9 was among the few cells lines approved for use by researchers funded by the federal government before new lines began to be approved in mid-December 2009, many researchers already have considerable experience with coaxing the cells into differentiating into specific types of tissues, for example, which would make the ability to genetically modify them particularly valuable.